The 35th edition of the girls Meet of Champions was one of the most memorable ones, certainly worth the extra one day wait after the weather postponement. Three meet records (3200m, pole vault, and triple jump), several spectacular doubles, a remarkable solo 800m performance by Jill Smith (left) contrasted to the jaw-dropping two-woman 3200m battle between Katie McCafferty and Melanie Thompson, a galaxy of former New Jersey stars spectating at the meet – it all made for an unforgettable evening of action that was the most fitting end to yet another high quality season of spring track in the Garden State. After four years of unquestionable reign of Danielle Tauro, now running for Michigan, it was time to crown a new queen of New Jersey miling. With middle distance star and Tauro’s former Southern Regional teammate Jill Smith opting to defend her 800m crown instead and with top seeds Melanie Thompson and Katie McCafferty running only the 3200m later that night, the four-lapper became a wide-open event up for grabs. Only three girls (Ashley Cromartie, Clare Buck, and Marie Walsh) had run under 5 minutes at the group meet the previous weekend, so it was expected to be a rather slow, tactical race. And indeed, the first lap resulted in a pack or runners led by Cromartie splitting a not-too-quick 1:13.1. The Roxbury senior tried to push the pace on the second circuit but nobody helped her, which resulted in a pedestrian 2:30.0 800m split. Cromartie had a slight lead with Buck and Sophia Ginez on her shoulder, but almost the entire field was still in contention. Midway through the third lap Colts Neck senior Allison Linnell made her move to the front, and as she went through the 1200 split in 3:46.2 it became apparent we would see a mad dash to the finish, and the best kicker would win. Linnell (right) made a very hard move on the back straightaway, establishing about a 5 meter lead over Cromartie with half a lap to go. 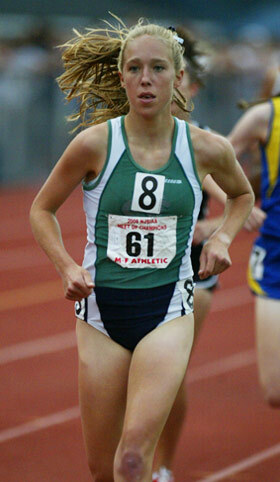 Despite the Roxbury senior’s good finishing speed, she could not close that gap, and Linnell, loudly cheered from behind the finish line by the former Colts Neck and current Princeton University star Ashley Higginson, held on to triumph in 4:54.87, nearly ten seconds faster than at the group meet. Incidentally, despite this victory the 1600m is not Linnell’s favorite event. She actually prefers running the steeplechase, which is unusual because the Garden State does not contest it on the high school level. But she runs this difficult event whenever she gets the opportunity outside of the state, such as the New York Relays earlier in the season and the upcoming Nike Outdoor Nationals. “I love steeple,” said Linnell who hopes to specialize in the event in college. Her victory extended coach Jim Schlentz’s streak of having a Colts Neck runner win the outdoor Meet of Champions 1600m or 3200m crown to four years in a row. Cromartie finished second in 4:56.38, one spot higher than last spring. Mount Saint Mary’s senior Liz Campbell came out on top in a wild scramble for third, clocking a 4:59.13. Two hours later Jill Smith toed the line to defend her 800m Meet of Champions crown. She was the heavy favorite, and she left no doubt about it, as only Roxbury’s Ariann Neutts was able to withstand her 62.7 opening lap. But by the time they entered the back straightaway the race was virtually over as Smith unleashed her lethal leg speed to shake Neutts off her shoulder and establish a commanding lead. During the last 200 meters her only rival was the clock, which she was able to stop in a remarkable 2:05.26, winning by more than three and a half seconds. Smith completed the second-fastest two-lapper in New Jersey history, slower only to legendary’s Joetta Clark’s 2:03.7 from 1979. She leaped ahead of the Olympian Hazel Clark on the all-time lists, not to mention the more recent Jersey middle distance stars such as Janine Davis and of course Danielle Tauro. Not resting on her laurels, the junior came back a little than an hour later to anchor the Southern 4x400 relay in 55.3 to victory and her second gold of the night. Meanwhile, Neutts faded on the last straightaway to fourth, passed by another Southern middle distance star Chelsea Cox and Pope John’s Emily Carrollo. The two girls waged a spectacular battle for the indoor 800m crown, with less than one hundredth of a second separating them at the finish. This time it was another lean for the tape, but unlike in the Toms River bubble, Cox came out slightly ahead now, grabbing the silver in 2:09.85, seven hundredths ahead of Carrollo, once again testifying to the depth of Southern Regional’s middle distance program. Last but not least, the longest event of the day went off under the lights, minutes after the sun had set and the temperature fell to more favorable level. This promised to be a fierce battle between the Penn Relays 3000m champion Katie McCafferty of Oak Knoll and the cross country and indoor 3200m Meet of Champions winner Melanie Thompson of Voorhees. McCafferty seemed to be the slight favorite, owing to her 9:37.15 clocking at Penn, but Thompson’s leg speed, sufficient to outkick Jill Smith at Holmdel last fall, could not be underestimated. The early leader was Kingsway sophomore Chelsea Ley, who finished third in cross country and indoors. Ley took the field through the first lap in a speedy 1:15.0 and the 800m split in 2:34.0. McCafferty and Thompson were right on her shoulder, and so was the silver medalist from winter Sarah Pagano. This foursome quickly broke away from the rest of the field, going through 1200m in 3:53.7. McCafferty then went into the lead to prevent the pace from slowing too much, and breezed through the halfway mark in 5:12.8 with the other three right behind her. After another two 78-79 second laps (actual splits: 6:30.8 and 7:49.9) McCafferty and Thompson (left, with McCafferty leading) opened a gap on the other two contenders, and it became a two-woman battle. With the Oak Knoll senior in constant lead they hit the bell in 9:07.7, and then all bets were off. Thousands of fans rose on their feet as they kicked all out, shoulder to shoulder, through the last straight, with only inches separating them at the finish. Melanie Thompson’s kick on the last 200 meters once again proved insurmountable, giving her the victory by one tenth of a second. It completed her remarkable cross country-indoor-outdoor triple crown, something that she will surely seek to repeat next year. But even more remarkable were the times registered by the two best distance runners in the state, 10:17.18 and 10:17.28, respectively. This was the third and fourth fastest 3200m clocking in state history and both well under the more than 20-years old meet record of 10:18.2 by the legendary Jodie Bilotta of North Hunterdon. This was a very fitting end to one of the most spectacular Meet of Champions in terms of distance events, and the fans might not be lucky enough to see such a speedy battle for many years to come. Moreover, Ley and Pagano did not fall that far behind, finishing third and fourth in respectively 10:27.90 and 10:29.79. In any year from 1989 till 2006 those performances would have given them a gold medal, sometimes by more than 25 seconds! But thanks to the remarkable improvement in the depth of the distance running among New Jersey girls in the last couple of years, they will have to come back next year to challenge Thompson for the title again. Interestingly, Ley completed a “bronze triple crown,” capturing third spot in the state in cross, indoors, and outdoors, all that in her sophomore year. This was supposed to be English Gardner’s day, and indeed it was. The Eastern Regional supersoph (right) defended her 100m crown, although she faced a close challenge from Deptford’s Audrey Wilson. Wilson actually ran a faster time in the trials, 11.91 to Gardner’s 11.95. But in the finals Gardner took control and won in 11.88, seven hundredths ahead of Wilson, although her time was much slower than the 11.49 at groups where she was probably aided by significant but unmeasured (no wind gauge) tailwind. A little later, Gardner came back to capture the 200 meter crown as well, pulling away on the last 50 meters to win in 24.34 and beat Teaneck’s Janay Mitchell by half a second. This was her fifth Meet of Champions crown, indoor or outdoor. The 400 meters featured a close battle between the indoor champion Nijgia Snapp of Oakcrest and the Seneca sophomore Michelle Brown, fresh off her impressive 53.91 clocking at the Group 3 meet last weekend. Snapp led for most of the race but Brown closed very strongly and captured the lead down the last straight, claiming the state title in 54.14, the fastest winning time in 11 years. The 4x400 relay concluded the long and eventful night with the seeded heat going off close to 9:30 PM. Millville, Camden, and others were in the early lead, but after Southern’s Chelsea Cox got the stick on second exchange in fifth place, she completed a 55.2 lap to bring her team into the lead and hand off to Jill Smith. At this point it was all over, with Smith blasting a 55.3 anchor without being seriously challenged and bringing home the gold in 3:49.57, almost two seconds ahead of Camden, and adding to Southern’s indoor relay title. In the 100 meter hurdles there was no less drama with the favorite and indoor 55m hurdle champion Samantha Sharper falling and not finishing in the final. Unheralded sophomore Briana Barlow of New Brunswick, seeded only 16th going into the meet, took advantage of it, winning in 14.27 over Azudei Dubois’s 14.32. It was the slowest winning time in 14 years. Over the past year, the South Plainfield facility built a second pole vault runway on the outside of the track, which allowed for conducting the boys and girls competition simultaneously so that both finished well before sunset instead of turning into the traditional late night matinee. On the girls side, it was a very high-quality competition, attesting to the continuing improvement of girl vaulters both in New Jersey and nationally. Natalie Gengel’s meet record of 12’3 was permanently erased from the books after two girls cleared 12’6, with Hanover Park’s Nicole Pompei (left) doing so on second attempt and the defending indoor and outdoor champion Jen Holly from Barnegat on her third. Montville’s Chrissy Finkel, whose 12’4 topped the state leaderboards before the meet, went out at that height, so it was down to two. Both Pompei and Holly missed all three attempts at 13 feet, but the former captured the gold thanks to fewer misses at previous height. Meanwhile, on the opposite end of the track there was a long 6-way battle for the high jump gold. Six girls cleared 5’6, including Alex Rosenberger of Ramsey, the only one who had jumped higher (5’7) this spring. But for the fifth time in the past 6 years no one could clear the next height at 5’8, so the gold went to Lacey’s Lauren Calorel, the only contestant to jump 5’6 on her first attempt. Rosenberger and three other tied for the silver. The multi-event star Josephine Kvist of Ridge made up for her disappointing third place long jump finish in the Group 4 meet last weekend by winning the event rather handily with a leap of 18’3, the only 18-footer of the afternoon. 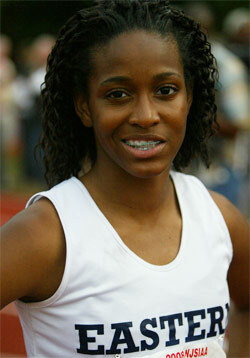 She also won two medals on the track, finishing fourth in the 400 meter hurdles and fifth with her 4x400 relay. Yet another meet record went out the door in the triple jump, where Kennedy’s Shanaie Herber shook off her disappointing tenth place in the long jump (she was seeded second there) to unleash a spectacular 40’7, which not only gave her the gold but also shattered the meet record by almost a foot and was second to only Carlene Cummings’s state record of 42’2.75 in the New Jersey history books. Marlboro’s Ada Unachukwu also exceded the previous meet record of 39’9 with her 40’0 leap, becoming only the fifth 40-footer in state history, including third this year alone. The level of competition in this event, contested at the Meet of Champions only since 2000, appears to be improving very rapidly in New Jersey. 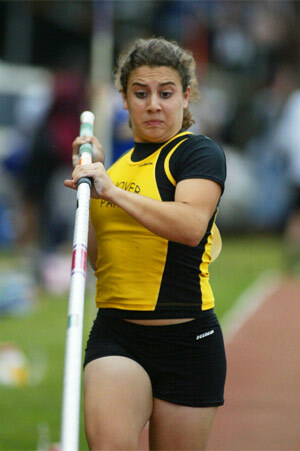 Hahn also faced a significant challenge in the discus throw, where she was the heavy favorite, but her 139-6 was enough to triumph by three feet over River Dell’s Christine Coppola, although it was significantly shorter than her seasonal best of 153’3 from county championships last month.